The nose is an area we usually don’t think about in terms of filling or enlarging. However, irregularities, bumps, scars and imperfections can be smoothed and reshaped with the addition of structural fat. Skin cancers of the nose are common, and treatment often leaves an unattractive defect and scarring. Fat can be placed to soften the scars and fill in the defect. Likewise, a bump on the nose can be disguised by placing fat above and below the area, and visible cartilage in the nasal tip from a bad “nose job” can be camouflaged. But LipoStructure fat grafts into the nose are most useful for rejuvenation and correcting nose deformities from previous nose operations. 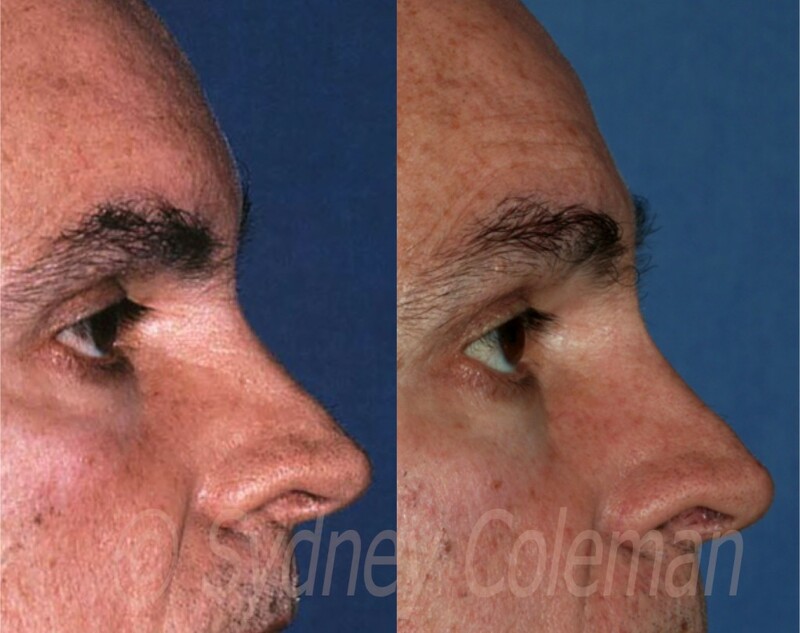 Fat grafted to the nose by the Coleman method does not feel like fat, but rather feels like skin, cartilage, bone or muscle , basically assuming the quality of the part of the nose into which it is placed. The aging nose loses fullness in the upper nose and between the eyebrows more than any other location. As this area atrophies, wrinkles form between the eyebrows and on the upper nose. As the upper nose shrinks, the remaining parts of the nose become relatively larger. Therefore the tip appears larger with the atrophy of the upper nose. As this happens, the tip may also appear to plunge. 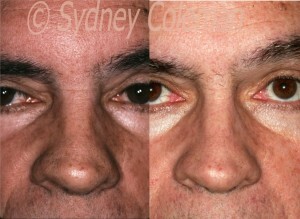 62 year old presented with wrinkling of the upper nose, with flattening (left). 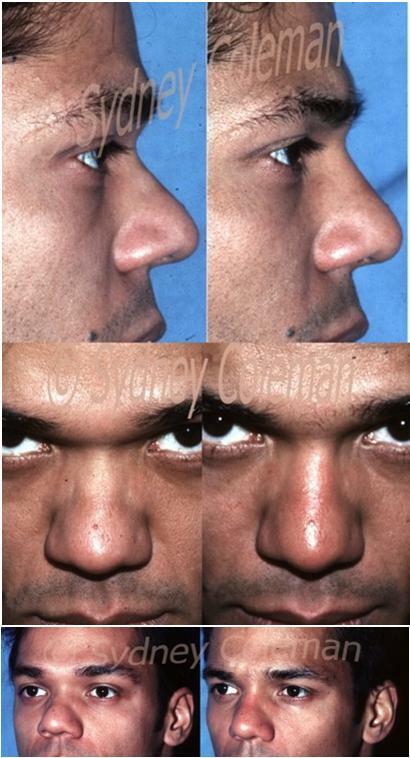 Four years after placement of structural fat to the central upper nose and between the eyebrows, the nose appears narrower due to a “tenting” effect. In addition the wrinkles are remarkably softened and even the eyelids are smoother from the distraction of the fat “ironing” out the sagging skin. Rhinoplasty surgeries often leave a nose with an “open roof.” With this common deformity, the cartilage and bony parts of the nose have been separated so that it looks like a long trough through which the septum can be felt or even seen through the thin skin of the nose. In addition, the cartilage or bone can become deformed in many ways after rhinoplasties. 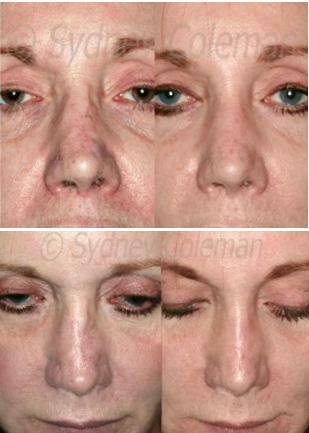 The skin of the nose in some patients is so thin that irregularities can be amazingly visible after nasal surgery. For the patient seeking a stronger nose, more definition to their nose, or a change in relative proportion of one part of the nose to another or to the rest of the face, fat grafting is a useful tool. 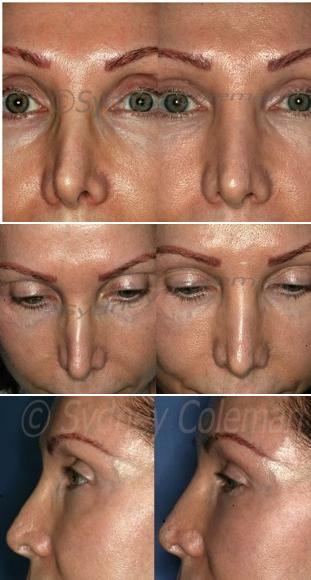 This woman had four nose procedures on both coasts and silicone injections to the nose. Follow-up at one year after one fat grafting procedure (right) reveals a remarkably more normal appearing nose. The upper nose flows more naturally into the lower nose, with a more distinct central light reflex and many less irregularities. Placement into the nostril rim flattened the notching and appears to have pushed the nasal tip over to the middle from the right. Also note the softening of the upper and lower eyelids with fat placement into these areas. This patient presented after at least 12 previous nasal procedures, including GorTex placement and removal, numerous cartilage grafts from her ears and one from her chest. One year after her second procedure, you can see softening of the irregular cartilages along with an apparent thickening of the skin over the entire nose. The area between the eyebrows is slightly fuller with a lessening of the frown wrinkles.